This collection of urban myths, fibs, folk tales and Forteana wanders wondrously, like a drunken greenkeeper spilling clippings from his wheel barrow, along the uncertain edge of mythogeography. The Portsmouth shirt buried under the turf of Southampton’s new ground, the concrete tower of esoteric energy at Sway, a travelling nose, a dancing axe, a double gibbet, a town hall in the middle of nowhere, the etiquette of highway robbery, upside down cabbages, the 4 tickets sold for a Beatles gig in Aldershot - these are Michael O’Leary’s props. 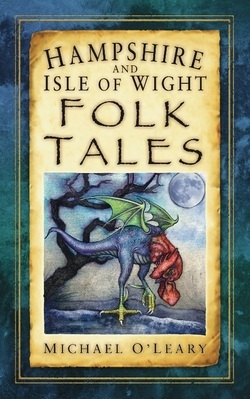 His characters include The White Stag, fat fairies, Buster Crabb the Cold War diver “floating off Pilsey Island minus head and hands”, King Rufus offering himself in the New Forest as a ritual sacrifice on Lammas Eve to a Mithraic cult, The Apple Tree Man and the fabulous ‘Jump To Glory Jane’ - a ghost who leaps into cyberspace. Though O’Leary deploys faithful storytelling tropes – the threefold rule for example - his characters are often self-reflexive: “Very well, I will go. I will do what they do in stories” and his most folkloric tale - of Mad Tom - was cooked up by John Schlesinger for a movie, ‘Black Legend’, in 1948. He mythologises himself as a storyteller and one of his most affecting passages is when he describes his own baptism in Pan-ic; settling down in a forest amid feelings of dread he wakes to see the trees “as if I was looking through night-vision binoculars – everything seemed red and slightly glowing” hiding his head in his sleeping bag till dawn. O’Leary has a fine sense of genius loci, just as interested in the convenience store and the grass verge as he is in the bucolic valley, his downs are always up, and a key source is “the bloke with the hi-viz jacket, who I meet at the burger van”. His tales are themselves nomadic: “the best way to find stories is to get out there – to put on the boots and explore”. O’Leary loves words and their multiple meanings – he has a “Phooka” with the head of a goat, he lures us through the woods until we “find ourselves entering Betty Munday’s Bottom”, he rolls out place names like poetics diction - Durns Town, Birchy Hill, Tadley God Help Us, Ashley, Bashley, Tiptoe and Hordle - he moves through the literary gears, switching from whimsical to scarifying, and then the albino badger, dug out by baiters, returns as a cadaverous carter for his assailants, “rivers of blood pour out and upwards, through the windows and door of the church, up in the sky”, and monsters copulate over the Isle of Wight. Don’t be misled by the functional title – there’s plenty here for the anomalist.